Semisonic is a power pop/alt rock band formed in Minneapolis, Minnesota, USA. Band members are Dan Wilson (guitar/vocals), John Munson (bass), and Jacob Slichter (drums). After the breakup of Trip Shakespeare, Dan Wilson and John Munson joined up with drummer Jacob "Jake" Slichter to form Semisonic in 1995. An EP, Pleasure, was released that year and the studio full-length Great Divide in 1996 on MCA. After the breakup of Trip Shakespeare, Dan Wilson and John Munson joined up with drummer Jacob "Jake" Slichter to form Semisonic in 1995. An EP, Pleasure, was released that year and the studio full-length Great Divide in 1996 on MCA. 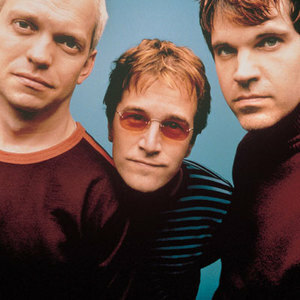 Semisonic's breakthrough came two years later in 1998 when their sophomore effort, Feeling Strangely Fine, reached the Top 50 chart on the strength of the hit single "Closing Time". Their international career also blossomed when another song from the album, "Secret Smile," quickly became a UK radio favourite in the summer of 1999, eventually peaking at #13 on the official UK Singles Chart. In early 2001, the band released its third album, All About Chemistry. The single "Chemistry" was a mainstay overseas; however, the album didn't fare as well in the United States. Another song, "Over My Head," was used in the 2001 teen movie Summer Catch, and Semisonic rode the wave of various tours in and around the UK. In the fall of 2001, Semisonic contributed their cover of the Wings classic, "Jet," for the Paul McCartney tribute CD, Listen to What the Man Said. Semisonic has been on hiatus since 2001. Band members have since pursued other projects, such as Slichter's writing career and Wilson's solo recordings They performed for the first time in years on July 14, 2006 for the Minneapolis Aquatennial. They have also been spotted performing for private parties in basements. * The song "F.N.T." was used in the 1996 movie The Long Kiss Goodnight. * "F.N.T." was also used in the 1999 movie 10 Things I Hate about You. * "Never You Mind" appeared on the Never Been Kissed soundtrack in 1999. * "Chemistry" appeared on the 40 Days and 40 Nights soundtrack in 2002.